Farming & Countryside Education (FACE) has created a new downloadable resource pack for teachers who would like to take learning outside the classroom this spring. The first in a series of seasonal e-booklets has a variety of suggestions for learning outside, making the most of the outdoors, and celebrating spring. 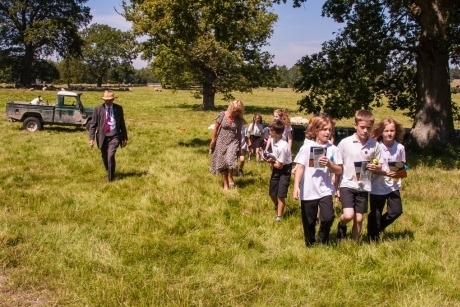 Through the resources, students of all ages are encouraged to investigate and explore the British countryside. Activities tie into the studies of Science, Geography, English, Maths, and Art & Design. Spring offers the opportunity for feeding and learning about lambs; teachers can contact a FACE regional co-ordinator to find out about farms with lambs on that are close by to their school in order to organise a visit. After feeding the lambs, children can tie the experience back into classroom learning by practising writing new words like ewe and lamb for English, and learning about selective breeding in Science. Learning outside the classroom doesn’t have to involve a coach trip to a remote location. The new FACE e-booklets detail information for how pupils can learn about birds, how to feed them, how they camouflage themselves and the importance of food chains using a hedgerow not far from the school grounds. The booklets also outline a series of games that can be played to help children understand how birds find food, and how that food (caterpillars and insects) can stay hidden to avoid being eaten. They explain how different coloured pipe cleaners can act as caterpillars in different forms of camouflage – teachers can hide them and teams of children (pretending to be birds living in the hedge) can race to see who can find the most. The FACE resources also demonstrate how teachers can plan a walk in their local school area or on a farm to encourage pupils to identify flowers, spot new buds about to bloom, find frogspawn or catch sight of birds nesting. Alternatively, they suggest that a spring treasure hunt can be organised. For this, each student will need an empty egg box; the aim is to find six interesting items to look for outside that link to spring to put inside it. The e-booklets also encourage students to find items on the ground like petals, pebbles and feathers, as opposed to picking flowers. And, as the resources suggest, when back in the classroom the children can link the treasure hunt to English studies by coming up with adjectives to describe each item found. For further information visit www.face-online.org.uk.